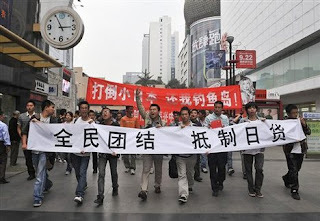 Tokyo has protested to Beijing over the “extremely dangerous” actions of a Chinese military helicopter that buzzed a Japanese destroyer operating in the sensitive waters of the East China Sea. The incident highlights the potential for frictions between East Asia's leading powers as China's increasingly potent military becomes a more assertive maritime player in the region. It is the latest in a string of incidents in which regional neighbours have accused Chinese vessels or helicopters of reckless behaviour at sea. Last week, Manila protested against an incident in which it said Chinese patrol boats threatened to ram a Philippine survey vessel in the strategically important and resource-rich South China Sea. Concerns about China's rising power prompted Tokyo to last year order a sweeping reordering of its military forces intended to give it a stronger and more mobile presence in southern Japanese islands bordering the East China Sea. Japan's defence ministry said the Chinese helicopter had been flying at an altitude of just 40m when it came within a horizontal distance of about 70m from the Japanese destroyer Samidare on Monday afternoon. “This behaviour is extremely dangerous,” Toshimi Kitazawa, Japan's defence minister, told a news conference on Tuesday, adding that Tokyo had already protested to Beijing “through diplomatic channels”. Officials said the Chinese helicopter had this time come even closer than during a similar incident in April last year that was also protested against by Tokyo. The East China Sea is a focus of Sino-Japanese tensions, with both sides claiming large swathes of its resource-rich waters as their own exclusive economic zones. A Japanese defence ministry official declined to give details of where the latest incident occurred, but denied media reports it was near the controversial Chunxiao gas field, where Tokyo says Chinese drilling operations could be drawing gas from across the “median line” that it claims as the border of its EEZ. In 2008, Beijing and Tokyo announced they would work together to exploit gas reserves in disputed areas of the East China Sea, but progress has since stalled. Beijing halted discussions on joint gas development last year after a Chinese fishing boat clashed with Japanese coastguard near a group of disputed islands known as the Senkakus in Japanese and the Diaoyus in Chinese. Military officials from south-east Asian countries say Beijing has been evading dialogue on conflict prevention in disputed waters. The Chinese government says it has been working to assuage regional concerns triggered by its growing power. “We realise that some people doubt our strategy of peaceful development and have concerns over China’s rise,” said a senior Beijing official involved in foreign policy planning. But he blamed these doubts on foreigners’ ill will and failure to understand China. The naval arm of China's People's Liberation Army is rapidly expanding the range of its patrols and exercises, but has said it aims to dispel doubts among neighbours by being more transparent. Last summer, it began announcing most of its regular naval exercises in advance. Two years ago, the US accused China of a series of harassments of US Navy surveillance vessels in both the East China Sea and the South China Sea. However, Chinese and US military officials have an ongoing dialogue about “rules of the road” meant to prevent collisions in regional waters, and US naval officials say there have been no new incidents between the two sides over the past year.